There are a bunch of perks to being the very first of anything, especially the first president. Sure, you don't have a previous president to blame stuff on, but it also means you are totally allowed to make stuff up as you go. 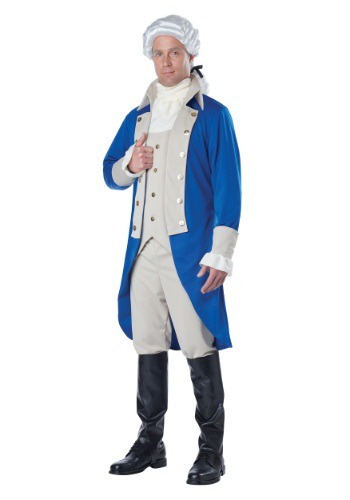 Step into the shoes of the guy who literally wrote the book on being the US president with this George Washington Costume, and add some patriotic authority to your day! Every American knows who George Washington is (at least as the "dollar bill guy"), but it's impossible for us to know what he was actually thinking when he became the country's very first president. He managed to make it work, but what kinds of things could he have done during his presidency that would have made the government a lot stranger? Could he have issued an executive order that all disputes in Congress were to be resolved by a potato sack race? Or, that the president got to wear a superhero style cape as part of their official uniform? It sounds weird, but compared to some real parts of the government, not that weird. No need to worry about looking weird, though, because when you're dressed in this presidential outfit, you're the boss (as long as you also get a majority vote from the costumed electoral college). The overcoat, vest, and matching trousers are a fine example of 18th Century style, and be sure to add a powdered wig to complete this Founding Fatherly look. Whether you're wearing it for a historical reenactment or play, or just having some patriotic costumed fun, you'll look truly revolutionary!